Fans and racers have had this date marked on their calendars awaiting the return of the Pro Late Model division to Montgomery Motor Speedway. It only took 6 minutes on the track during practice for the sparks to fly. Veteran driver Clint Folsom from Pelham, Al made hard contact with the outside wall in turn 1 destroying his #42 Machine and stopping the early practice session for over 25 minutes as MMS Safety workings cleared the wreckage and prepared the racing surface. The 68 year old racer was able to walk away from the wreck and credits that to the well built chassis from Port City. Budweiser qualifying came next for the Pro Late Model drivers as they lined up on pit road for their 2 timed laps around the Historic oval. The field had a mixture of motor packages from crate motors to 2 barrel built motors. Qualifying times were very close but local star Hunter Robbins piloting the Pitboxes.com / Atco transmissions Ford Fusion to fast time at 18.842. The Red Ronnie Sanders owned machine looked smooth as Hunter logged his 2 laps to capture his first Budweiser fast time Pole Award for the 2014 season. John Bolen from Jasper, Al just missed the top spot with a time of 18.992. Dennis “Tink” Reno rounded out the top 3 with an Impressive 18.994. During Opening ceremony Hunter Robbins rolled a 2 on the inversion placing the Chevrolet Impala SS of John Bolen in the top starting spot. Fans were treated to an on track autograph session before the 100 lap feature and kids of all ages flocked to the front stretch to meet their favorite driver. 2014 saw a slight change in race procedures announced by MMS Race Director Ivo Estes at the drivers meeting as the lines for the start of the race have been moved to the front stretch. Long time flagman John Midkiff will start all races from the flagstand and was not pleased with the initial start but the racers got it right from that point forward. The Southern music and Games, GARC Robbie White race engines sponsored # 2 took the lead from the start and looked impressive as Bolen stayed on the point till the caution flew on lap 10 for a single car accident in turn 1 involving the #3 of Jordan McCallum. The Lizella, Georgia driver headed to the pits for repairs and the race went back to green on lap 13. Bolen logged some laps as the #18 of Robbins kept him in his sites. Dennis Reno Jr in the X2 stayed within striking distance holding the third spot. Lap 38 saw the yellow rag fly again as debris was spotted on the track slowing the field. The #30 car of Rusty Sanford was awarded the lucky dog pass placing the Seminary, Mississippi driver back on the lead lap. Lap 43 saw the pace slow again as the #5 car of Chase Oliver smacked the turn 1 wall and sent the Crossville, Alabama driver to the pits with major right side damage. Lap 49 saw the field restart again with Bolen and Robbins leading the way on the front row. As the field was crossing the start finish line the #33 of Dustin Smith had mechanical issues and didn’t reach race speed collecting the #07 of Blake Ferguson and the #30 of Rusty Sanford sending the #07 Jasper, Alabama driver hard into the inside wall at the entrance of turn 1. The #30 car was able to pull away from the accident scene but the 82 wrecker crew had to be called to remove the heavily damaged United Motor Company / Ferguson Automotive sponsored car of Ferguson, ending his night. Lap 55 brought out the last caution of the evening as the # 33 Dustin Smith made contact with the turn one wall sending him behind the wall also. Lap 58 to 100 saw the track clean and green as battles waged on at different parts of the raceway. The # 17 chevy of Chuck Tuck drove a smart race and avoided trouble keeping all 4 fenders on his Midsouth Plumbing / Nip & Tuck Florist machine from Athens, Alabama and finishing 6th. The # 18 of Hunter Robbins slowly worked his way to the back bumper of #2 Bolen and the fans were treated to some great side by side racing for the lead. Meanwhile the #13 car of local favorite Bill Bethea III was stalking the x2 of Dennis Reno Jr. On Lap 85 the crowd jumped to their feet as Montgomery Home Town favorite Robbins made the pass for the final time and secured his spot at the front of the field. The excitement wasn’t over as a show was going on behind the leaders featuring Bethea making a pass on Reno for third position on lap 97 securing a podium finish for the Montgomery, Alabama driver on this first Pro Late Model race of 2014. 4. 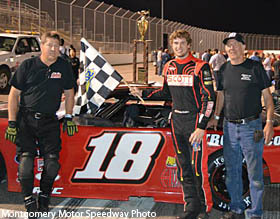 #x2 Dennis Reno Jr.
Hunter Robbins got the win at Montgomery.